Of course, I had to start out with who is basically the queen of bullet journaling - Mrs. Kara Benz herself, AKA Boho Berry. She also has a blog, a YouTube channel, and an Etsy shop where she primarily sells planner stickers. I think her style is best described as generally clean but very colorful at the same time (which kind of sounds like a paradox, but it makes sense if you look through her pictures). Kim, or Tiny Ray of Sunshine, is a minimal bullet journalist. Her spreads are generally quite simple, but they look very streamlined and ascetically aesthetic. She also has her own blog, but she writes for the official bullet journal blog, too. Emma from That Journal posts a picture of her daily spread every single day, so you can look at her account all the time for new inspiration. She has quite an artistic style, and she uses a lot of colored pencil to color her headers; they're generally quite doodle-y. Kacheri/Passion Themed Life is also quite artistic (she's even going to college for art right now, I believe), and this is reflected in her bujo. Her layouts are kind of like organized chaos in a way? They are typically very free and flowy. She also has a blog and an Etsy shop selling planner stickers and various other planner things. Dee Quine, AKA Decade Thirty, is a minimalist when it comes to bullet journaling; she usually writes with just one black gel pen, and her spreads are overall very simple. However, it lets her AMAZING handwriting shine through. Seriously, I love her handwriting so much; it's absolutely gorgeous! She also has a blog and an Etsy shop for planner printables, though she doesn't have as much time to post online anymore since having her first child. Jessica from Pretty Prints and Paper is a college professor and a freelance calligrapher on the side, but she is also really into sketchnoting, so her bullet journal is very visual; she incorporates a lot of calligraphy and different graphics in her spreads. She also has a blog and a YouTube channel. Roberta is a bullet journalist and stationery lover from Italy. Her style is generally clean but with pops in color, either with calligraphy or little doodles. She also has a YouTube channel (some of her videos are in Italian, but most of them are in English). This is the official Instagram account for the system, and it's run by Ryder Carroll, the creator of the bujo. Though he doesn't post pictures of his own bullet journal, he shares and reposts pictures from throughout the platform. It's usually a good place for minimalist bujo inspiration. Heather from Ohayo Bento is also a minimalist bullet journalist, and her spreads are very clean and simple. She also sometimes shows her art journaling and has a blog. Yu/Blue Lahe is a student from Italy, so her feed is a bullet journal-based studygram account. Her bujo is very aesthetic, and though it's streamlined and clean, it's still very colorful; both her bullet journal itself and her pictures are very pretty. She also has a YouTube channel. Trine from Log That Life has a very minimalist bullet journal. Her spreads are very simple and neat, and I believe she uses a single fountain pen inked with black for her layouts. She was also recently featured on the official bullet journal blog. Brian Qian, AKA Study with Inspo, is another studygram person, so his bullet journal pics are mixed in with occasional pretty school notes. Anyway, his style is similar to Blue Lahe's in that his spreads are very neat and clean but are still colorful in a very calming way, and he also incorporates embellishments like calligraphy, doodles, washi tape, and sticky notes; his pictures are all super pretty. He also has a YouTube channel and a Tumblr. Lisa Jacobs is known for her blog Marketing Creativity, but she also is a bullet journalist. Her spreads tend to be very "free form" (if that makes sense), and she uses a lot of sketchnoting in her layouts. So, you'll see lots of graphics and hand-lettering in her bujo. Ashlyn/Nittany_Bujo has a very doodle-y look with her bullet journal. I think her specific style of lettering/handwriting and the way she draws her spreads just makes it seem very . . . cutesy? I don't really know how to describe it, but she has a very distinct style, so just look through her feed and you'll know what I mean. She also has a blog. Show Me Your Planner, run by Kat, is an account that features other people's pictures. The spreads tend be bright and colorful, but it really varies from post to post. I think it's a great account to follow for a large diversity of layouts. She also started a blog for even more inspiration. Chloe Linn from Daintily Noted is a student in university, and she is a miniamlist bujo. Her spreads are just so beautifully clean and simple, and she typically utilizes bits of pastel marker (like in this picture). She also is a self-titled "mother of succulents", so that's pretty cool. Erin has a very scrapbook-y, almost collage-like style of bullet journaling. Her pictures are always so aesthetically pleasing, and she likes to use things like washi tape and photos that match the color scheme of each individual spread. As her account is a studygram, she also sometimes posts school notes and various other stationery things, but the majority of her photos are of her bujo. Cristina of My Life in a Bullet has a very clean and bright bullet journal, and she uses lots of calligraphy and bright colors. She also has a blog, a YouTube channel, and an Etsy shop for planner printables. Sprinting Studies is an IG account that reposts other people's pics, and since it's a studygram account in general, there are also stationery/desk photos and aesthetic notes along with the majority of the account: studyblr-worthy bujo pics. 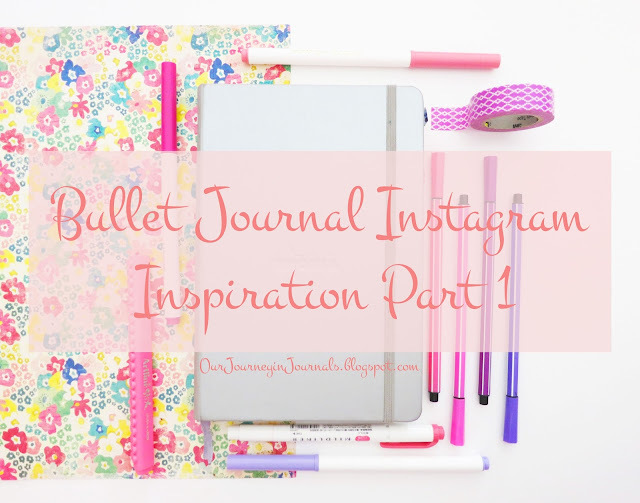 Since each picture is from a different person, you'll see a large variety of different types of bullet journals. However, they're all very pretty, so you can get a bunch of different inspiration from the account. Like I said, there are so many great bullet journalists on Instagram, so this was only the tip of the iceberg. And of course, try not to compare your own worth as a bullet journaler to other people's super pretty pictures! Anyway, I plan on featuring more accounts in the future, so stay tuned for that and other bullet journal related posts on this blog. Also, make sure to tell me which accounts you really like so I can incorporate those into future posts!